Yesterday (March 24), Al Paslow, a member of the Antique Telescope Society, and members of a demolition crew opened a time capsule, a small brass box sealed with solder, that had been placed inside a cornerstone of the now-demolished Brashear Telescope Factory building on the North Side of Pittsburgh. The building, built in May of 1886 and added to the National Register of Historic Places in 2012, was originally the home of the John A. Brashear Company which had manufactured hundreds of telescopes and precise scientific instruments for observatories and scientific institutions throughout the world, in the latter part of the nineteenth century and the first half of the twentieth century. Demolition of the historic building, which had been vacant for about 20 years, was necessitated after a wall of the building collapsed onto a nearby two-floor apartment building on March 16. The apartment building had to be evacuated, until city inspectors declared the building safe for occupancy. Jadell Minniefield Construction Company, of the Hazelwood section of Pittsburgh, demolished the Brashear Telescope Factory building under an emergency demolition order issued by Maura Kennedy, who heads the City of Pittsburgh's Department of Permits, Licenses, and Inspections. While inspecting the remains of the nearly-demolished building yesterday, members of the demolition crew showed Al Paslow a time capsule that had been found near a building cornerstone a few days earlier. After calls to several societies and organizations went without result, it was decided that Al Paslow and three members of the demolition crew would open the time capsule and photo-document the contents. 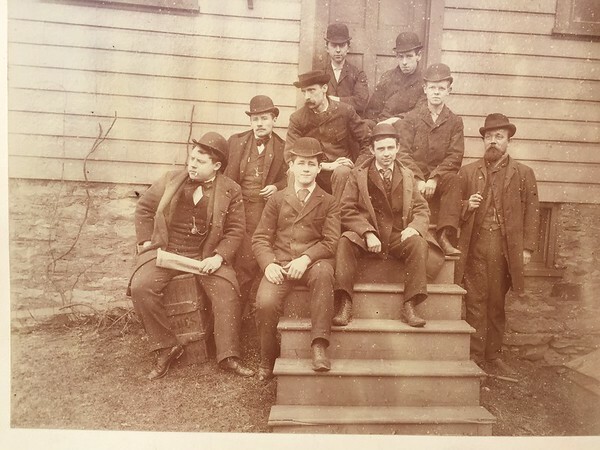 As displayed at the beginning of this blog post, one photograph in the time capsule shows employees of the Mechanical Department of the John A. Brashear Company. The photograph is dated August of 1894, which is eight years after the construction of the Brashear Telescope Factory building. So, unlike most building time capsules, apparently this time capsule was installed after building completion, instead of during the laying of the building's cornerstone. at the bottom of the time capsule box were plans and blueprints for the factory building. In an electronic mail message distributed over the Antique Telescope Society's mail-group (copied over the History of Astronomy mail-group by John W. Briggs) yesterday, Al Paslow wrote, “Most of the contents of the Time Capsule are in remarkable shape; however some older photographs are faded but many look as good as the day they were left inside.” He has placed many photographs of the time capsule contents on his personal Internet web site (a link to this web site is at the end of this blog post). The wall collapse had occurred on March 16, with demolition of the rest of the building beginning the next day. When the author of this SpaceWatchtower blog, Glenn A. Walsh, viewed the site on the evening of the Vernal Equinox (March 20, the official beginning of the season of Spring), the majority of the building had been brought-down, with the exception of small portions of the north and south walls. In his March 24 e-mail message, Al Paslow reported that the demolition was completed, and the site has been covered in straw, as of Tuesday afternoon (March 24). Al Paslow did not mention the disposition of the time capsule and contents in his message. As, at the time of demolition, the Brashear Telescope Factory building was legally owned by the City of Pittsburgh, the time capsule and contents would be the legal property of the City. Special Thanks: Al Paslow, John W. Briggs, Antique Telescope Society, History of Astronomy Mail-Group. Brashear was indeed an extraordinary telescope-maker. His refractors are legendary as they usually had the flint element in front of the crown one.